The reason I say that Bob's article was very strange is that he posted a whole heap of charts showing monthly sea surface temperature in the region above where the hurricane started, and said, look here, it was as hot in the 1940s in this little part of the ocean. 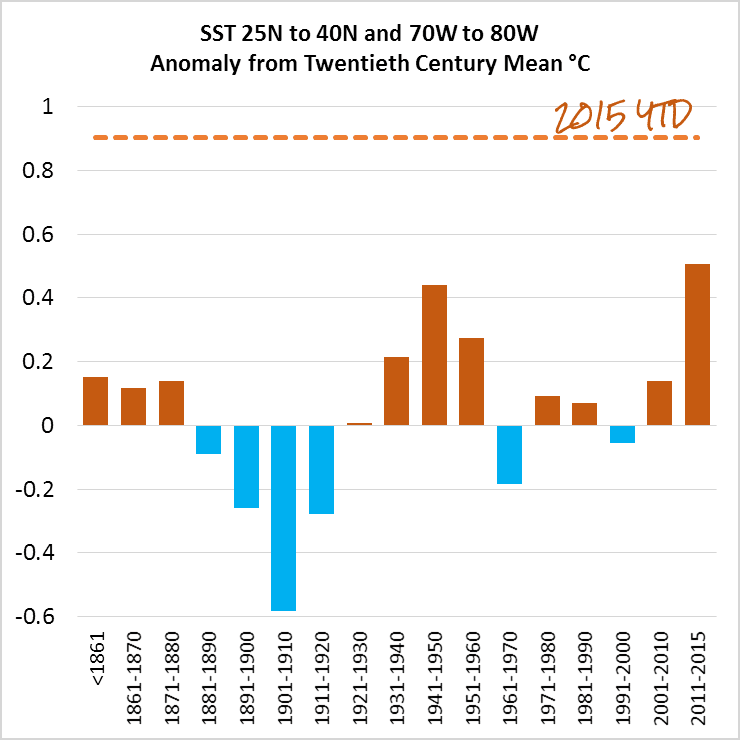 So alarmists are going to be wrong. And we’ll present the data starting in 1940 to be consistent with those Sandy posts. In other words, we’re going to confirm that the sea surfaces along Joaquin’s forecasted storm track show no warming (based on the linear trend) for more than 70 years. Bob's a bit mixed up. Sandy was made worse by the higher sea levels, which are rising with global warming. The warmer seas may have made a difference to the storm track and intensity, but it was the sea surge that did so much damage. His other problem is that at the small scale, sea surface temperatures can rise and fall quite a lot. You're going to find it difficult to weed out the global warming signal from all the noise of month to month fluctuations. At the global level it's easier to see the signal. I don't know if Bob is arguing that warm seas don't contribute to tropical cyclones or not. He's wrong if that's his argument. The point is that over warmer seas, hurricanes are likely to get more intense. Just ask Judith Curry (who no longer seems very interested in hurricanes). Joaquin intensified from a tropical storm to a class 3 hurricane, skipping quickly through classes 1 and 2 in a matter of hours. And the point is that all the instrumental data on sea surface temperatures in the region shows that the seas are very hot. A general rule of thumb is that the shear must be 20 knots or less for intensification to occur. Most instances of rapid intensification of hurricanes occur when the wind shear is 10 knots or less. However, large and powerful hurricanes can be resistant to shear values as high as 40 knots, as demonstrated by Hurricane Wilma (Figure 1). We often see tropical disturbances under 10 knots of wind shear that do not develop. Why? Oftentimes, this is because cold, dry air aloft associated with an upper level trough of low pressure is interfering with development. Tropical cyclones develop most readily when an upper level anticyclone (high pressure system aloft) is present overhead. A non-tropical trough of low pressure (Invest 98L) is producing disorganized showers and a few thunderstorms over the western Atlantic Ocean several hundred miles south-southwest of Bermuda as the system drifts north to north-northwest at about 5 mph. With record warm ocean temperatures near 30°C (86°F) and wind shear in the moderate range, 10 - 20 knots, this disturbance may show some slow development on Saturday and Sunday. However, wind shear is predicted to rise to the high range, 20 - 30 knots, beginning on Sunday night. In their 8 am EDT Saturday Tropical Weather Outlook, NHC gave the disturbance 2-day and 5-day odds of development of 10% and 10%, respectively. Invest 98L could become a depression. West of Ida and east of the Bahamas, a gradually organizing area of showers and thunderstorms could become a tropical depression within the next couple of days. The system is passing over record warm ocean temperatures near 30°C (86°F), with wind shear in the moderate range (10 - 20 knots). NHC gives the system a 50% chance of development in the next three days. Wind shear is predicted to rise to the high range, 20 - 30 knots, beginning on Sunday night, which will likely put a cap on 98L’s development. Tropical Depression 11 took shape last night in the Northwest Atlantic between the Bahamas and Bermuda. In the grip of moderate to strong northwesterly wind shear (around 20 knots), TD 11 is struggling to organize itself, with an exposed low-level center on Monday morning. Showers and thunderstorms are fairly widespread and have persisted into Monday morning, beyond the typical nighttime convective maximum. The depression is over very warm sea-surface temperatures of around 30°C (86°F), about 1°C above average. As TD 11 moves slowly northwest over the next 2-3 days, it will remain over quite warm SSTs, but wind shear will remain on the strong side, denting TD 11’s potential for growth. Dynamical models are in general agreement in bringing TD 11 to tropical storm strength over the next several days. The high-resolution HWRF model is particularly bullish, with its 00Z and 06Z runs bringing TD 11 to hurricane status by later this week. However, the thunderstorms maintained their vigor with the help of record warm waters and excellent outflow toward the south side of Joaquin, allowing the storm to intensify to 50 mph winds by 11 am EDT Tuesday. 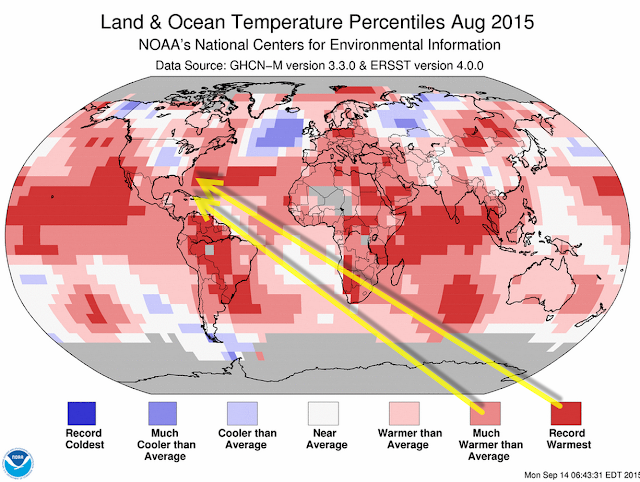 Ocean temperatures in the region are near 30°C (86°F)--the warmest seen there since record keeping began in 1880. The Hurricane Hunters will fly into Joaquin on Tuesday afternoon, and the first dropsonde mission from the NOAA jet is scheduled for Tuesday afternoon, as well. During its slow westward trek, Joaquin will be passing over ocean temperatures near 30°C (86°F)--the warmest seen there since record keeping began in 1880. Bob can talk about monthly averages over a region till he's blue in the face. A hurricane doesn't care about monthly averages a whole lot. If the seas are hot at the time, they'll help fuel the storm. One thing you'll have noticed if you read Bob's article, was that he just drew a linear trend line and argued that if the linear trend didn't increase from his start date of the 1940s, then there's been no warming at all. 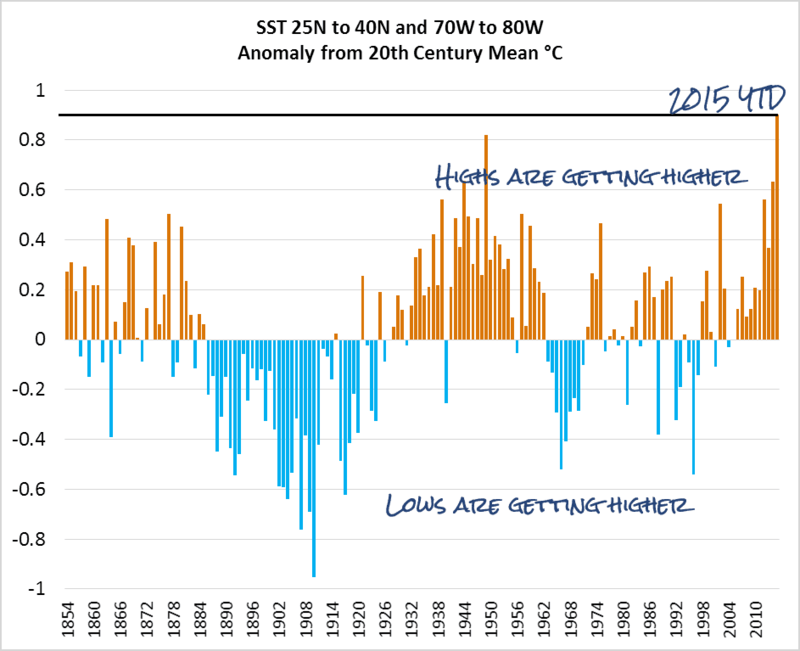 What he didn't draw his readers' attention to was the very high sea surface temperatures prevalent these past few years, even in his own charts. Let me show you. Bob didn't add the circle, arrow and text - that was me. Look at the very warm temps since the cold month in 2010 or 2011. Look at the minimum temperatures, the bottom of the blue lines. See how it's been well above the 1981 to 2010 average since around 2011. The high temperature shot up quite high, too. Source: WUWT and annotated by me. If Bob had been more honest, he'd not have put up a chart of monthly temperatures. Monthly data is very noisy and it's hard to discern a signal by eyeballing. He'd have put up a chart of annual or, better yet, decadal temperatures. Like this chart of annual temperatures for the region. I'm not suggesting anything about the sea surface temperature in that particular region except to note that this year they've been the highest on record. And that the hot years are getting hotter and the coldest years are also getting hotter as time goes by. However if he'd shown annual or decadal temperatures, Bob's weak non-argument would fall apart. 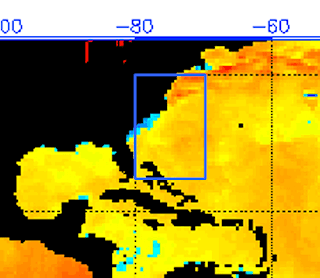 What you can see from the above is how warm the Atlantic has got. Whether the seas are at record hot temperatures or not, they are a lot hotter than the long term mean for the location. (The long term climatological mean from which the anomaly is calculated is described here. It's not a simple annual average baseline.) Most of the region in which the hurricane emerged and is travelling in is well above 1 °C above the long term mean for now. What Bob was trying to claim was that global warming hasn't contributed to Hurricane Joaquim. His evidence was that there have been times in the past that seas in the region have been warm. But that's not sufficient to justify his claim. What he would need to do would be to determine the likelihood of the occurrence of a hurricane now compared to the past, and the likelihood of its intensity. He didn't do any of that. Will tropical storms get more frequent and/or more intense? Bob used the wrong argument when he claimed that human-caused global warming didn't fuel Hurricane Joaquin. His argument doesn't stand up not only because seas are very hot, but because he didn't prove that AGW didn't contribute. 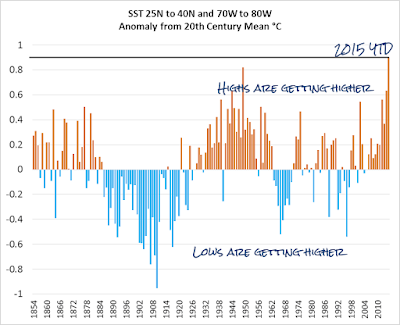 All weather is different now that we've caused warming. Tropical storms are as much affected by global warming as any other weather. The tricky part is working out how global warming affects them. Warmer seas are bound to make a difference. Seas are warmer not just in the region of the hurricane, but all over. 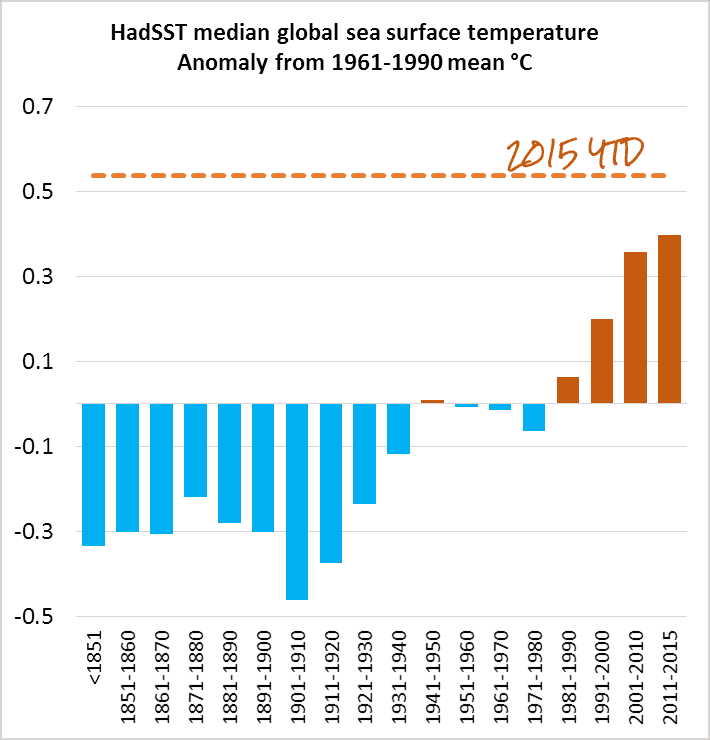 Below is a chart showing global median sea surface temperatures on a decadal basis, with the 2015 year to date average shown as a dotted line across the top. I don't know if any scientist will attempt to work out the likelihood of just this one Hurricane Joaquin, now that global warming is a reality, compared with pre-industrial times. I do expect that researchers will continue to investigate the likelihood of tropical cyclones in general, and their nature, as global warming progresses. And there will be scientists who will continue to monitor what is happening and see what, if any, trends there are in tropical cyclones over time. Stay safe, everyone. Whatever the track, the system is likely to bring a lot of rain to some parts. Most of the people commenting were more concerned about what path Joaquin would take than anything that Bob wrote. Below are a few "thoughts" from some of the few people who commented on Bob's article, rather than the hurricane itself. ShrNfr is going to be very disappointed because RSS and UAH don't report sea surface temperature. They measure the temperature of the air at varying distances above the surface. No-one at WUWT bothered to set him or her straight. Given the garbage methodology, I would be more interested in the RSS and UAH sea surface data. ohflow seems to think that Bob Tisdale showed charts of global temperature. He didn't. They were just the monthly sea surface temperatures of a teeny tiny bit of the Atlantic Ocean. PSU-EMS-Alum did read the charts, and asked why Bob's chart of modeled data was on a different scale to that of observations, with the observations showing a much greater range. Why is the range of Figure 2 (-0.6,0.6) while Figures 3 and 4 are (-1.5, 2.0)? I am not suggesting any nefarious intention, just that when doing visual comparisons it is nice to have the scales the same. The seas below Sandy were record hot, resulting in the system with most energy content on record (including those of the Shrieking Sixties/Furious Fifties/Roaring Forties etc). Her track was unique, though it was unique only for a couple of weeks afterward. That track was due to new weather patterns, blocking highs in positions that used to be 'forbidden' caused by Arctic Amplification. Hurricane Joaquin is also a major feat. - 2015 is the first strong El Niño year featuring more than one major hurricane during prime of season. 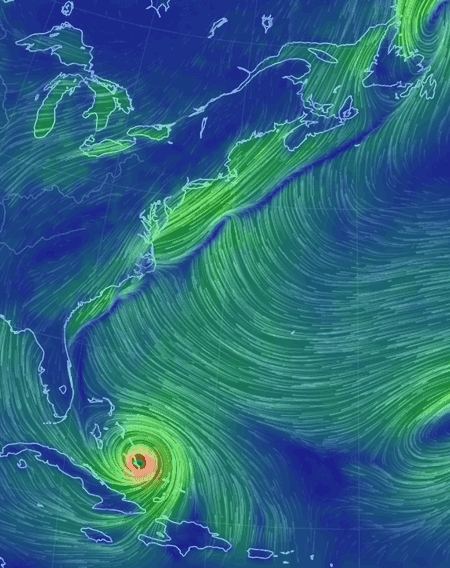 - Joaquin is the second strongest of those, losing only to Debby/1982. - Joaquin is a stalled system. It intensified during stall, notwithstanding a) push of dry air from the NE, b) interaction with the Bahamas and c) as a stalled system usurping those record hot SST's. "Time will tell whether hurricanes will become more frequent and more intense." Note ACE. Record for whole year already went months ago. It is already some six weeks into in complete freak territory with prime of hurricane and typhoon season still to be finished. The kind of thing I said and still won't pass some moderation at different sites will be quite okay to say within years even on those places (trust me, I'm already seeing a good trend). What it actually means is, among other things, the start of law suits against fossil fuel companies compared to which those against Big Tobacco will pale into zilch. It actually means at some point in maybe already a very near future that the answer to this question, http://www.newsweek.com/should-climate-change-deniers-be-prosecuted-378652 , will be a resounding 'Yes' - which is the very meaning of those comments moderated away. I will not repeat what precursory events are needed to establish that situation. Let's remember, somewhat obliquely of course, http://abcnews.go.com/US/north-carolina-bans-latest-science-rising-sea-level/story?id=16913782 . Uh .. shouldn't Bob be using 20-28N unless this hurricane is warping into the future to pick up energy from an area it hasn't yet reached? Yes. That was my immediate thought, also. So what I am gathering is that the sea surface temperatures are so warm that the medium to high wind shear did not tear apart joaquin like it did so many others this season.? Warm water wins over windshear ?this time.